While these domains are core to IPE, finding mechanisms in which to bring students of multiple medical backgrounds together and practice and teach such competencies is often difficult. Issues range from the activity itself (Clinical knowledge and experience depending on level of education at the time), timing (differences in scheduling across different schools, even on the same campus), and buy-in from students. That being the case, my recent experience at a Hackathon (covered here) has led to me wonder if Hackathons could be a valid means of accomplishing some IPE activities in a fun and constructive manner. A hackathon would be constructive in meeting several competencies set out for IPE, based upon the Core Competencies for Interprofessional Collaborative Practice. To recap, a hackathon is focused on bringing together a team of multiple areas of specialty to find a solution to a proposed problem in a set amount of time. For instance, the MedStart Challenge this year was focused on medical education. 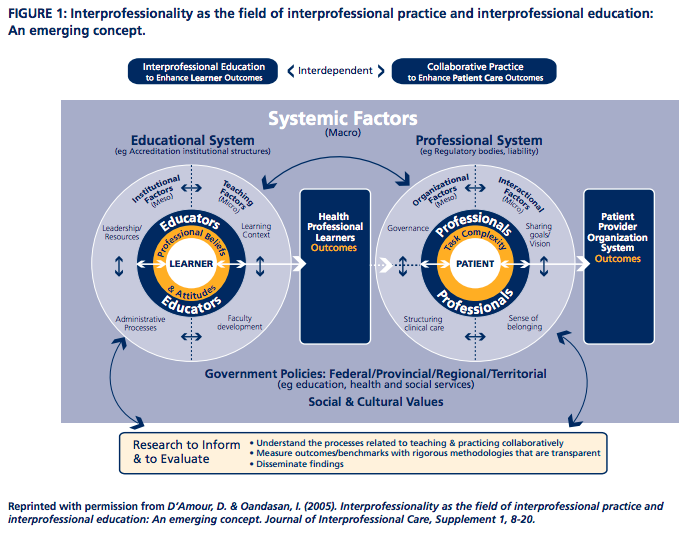 As such, this fits nicely into the proposed framework of IPE whereby education is interdependent on collaborative practice to enhance patient care outcomes,. Using a Hackathon, educators could bring together students of multiple backgrounds to address a problem that would be inherent to the overall healthcare sphere. This could range from patient care, engagement, education, and more. These ideas as such, are not necessarily dependent on student clinical knowledge, and I think this really came to the fore at the MedStart Hackathon where many attendees were 1st and 2nd year medical students, who still came up with awesome ideas. The other key competency that a Hackathon could address is the issues of communication and teamwork for IPE. Forming a team of multiple disciplines around a problem would allow students to learn from one another (which for me was the most amazing aspect as I learned alot from the programmers and business members of my team) and learn about delegating and sharing responsibilities in the allotted amount of time. I think these experiences would be meaningful in advancing knowledge and overall skills that can then be used upon future clinical practice and experiences on rotations. Lastly, a Hackathon really is aiming to address problems that are important at the current time. Students can be a refreshing source of innovation, and could come up with relevant ideas that others ingrained in the healthcare sphere do not see, and thus inspire interprofessionlism and understanding of roles and responsibilities. So How Would an IPE Hackathon work? Mentorship is key for success. Most of the participants at these events will be students and as such may have limited clinical knowledge and experience. As such, active engagement from the medical community will be needed to help guide students and particpants along to identify if the problem has already been solved, or how to improve upon current mechanics. Resources and space are required. Hackathons take alot of space and material. How long will the event run? A day? A Weekend? How will you feed participants, and where will they work on their ideas? If you are giving awards as incentives, what will it be? Find Sponsors. I think this is a key thing, as it gives you speakers, judges, and individuals that can help fund the event. Everyone likes a good amount of PR, and I think that is the key thing to identify for sponsors. Figure out if you want ideas or products. Some hackathons want a full fledged product at the end of the event. But this takes a dedicated, experienced team with multiple backgrounds (e.g. programmers, designers), which you institution may not have direct access to bring in. As such, creating pertinent ideas and sound pitches may be all you can work with, but I don't see that being a barrier, and may make it easier to center solely on students. Have a good team to set-up events. Get other students, campus organizations, and faculty involved to help set-up and run the event. I do not think only a few faculty members from one department can make a successful event. The MedStart program had alot of individuals which I felt make the event a success. Have Fun. I hope I don't have to explain this one. Share ideas. I am hoping research or articles will come out on this subject in the near future. I also hope others can share their experiences (even here) that can help others design and make similar projects work. I feel a hackathon could be a novel and fun IPE event to host at institutions looking for experiences to engage their students and potentially create relevant outcomes as well. I could be wrong, but wanted to 'pitch' my idea and see others thoughts and opinions, and I hoped you enjoyed this new concept! Gamification of Antibiotic Education - Tower Defense Anyone?